The fleshy mass of the leg proper (below the knee) is formed by a group of crural muscles, which act on the foot (fig. 10.35; table 10.19). These muscles are tightly bound together by deep fasciae, which compress them and aid in the return of blood from the legs. 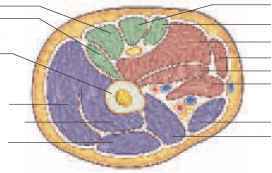 The fasciae separate the crural muscles into anterior, lateral, and posterior compartments, each with its own nerve and blood supply. N: long head—tibial n.; short head—common peroneal n.
sor of the great toe), fibularis (peroneus54) tertius, and tibialis anterior. Their tendons are held tightly against the ankle and kept from bowing by two extensor retinacula similar to the one at the wrist (fig. 10.36). 58sura = calf of leg way of the calcaneal (Achilles) tendon. This is the strongest tendon of the body but is nevertheless a common site of sports injuries resulting from sudden stress. The plantaris inserts medially on the calcaneus by a tendon of its own. There are four muscles in the deep group (fig. 10.38). The flexor digitorum longus, flexor hallucis longus, and tibialis posterior are plantar flexors. The popliteus unlocks the knee joint so that it can be flexed and functions in flexion and medial rotation at the knee. The lateral (peroneal) compartment includes the fibularis (peroneus) brevis and fibularis (peroneus) longus (figs. 10.37b, 10.38a, and 10.39b). They plantar flex and evert the foot. Plantar flexion is important not only in standing on tiptoes but in providing lift and forward thrust each time you take a step. Figure 10.32 Muscles of the Thigh. Anterior view. (a) Superficial muscles; (b) rectus femoris and other muscles removed to expose the other three heads of the quadriceps femoris. Figure 10.33 Superficial Anterior Muscles of the Thigh of the Cadaver. 1. The most superficial layer includes the stout flexor digitorum brevis medially, with four tendons that supply all the digits except the hallux. It is flanked by the abductor digiti minimi60 laterally and abductor hallucis61 medially; the tendons of these two muscles serve the little toe and great toe, respectively (fig. 10.40a). "short extensor of the digits"
60"abductor of the little toe"
61"abductor of the hallux (great toe)"
Figure 10.34 Gluteal and Thigh Muscles. Posterior view. lumbrical muscles located between the metatarsals (fig. 10.40b). 3. The third layer includes the adductor hallucis, flexor digiti minimi brevis, and flexor hallucis brevis (fig. 10.40c). The adductor hallucis has an oblique head that crosses the foot and inserts at the base of the great toe, and a transverse head that passes across the bases of digits II—V and meets the long head at the base of the hallux. 4. The deepest layer consists of four dorsal interosseous muscles and three plantar interosseous muscles located between the metatarsals. Each dorsal interosseous muscle is bipennate and originates on two adjacent metatarsals. The plantar interosseous muscles are unipennate and originate on only one metatarsal each (fig. 10.40d, e). 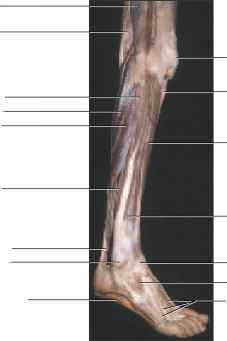 Figure 10.35 Superficial Muscles of the Leg of the Cadaver. Right lateral view. 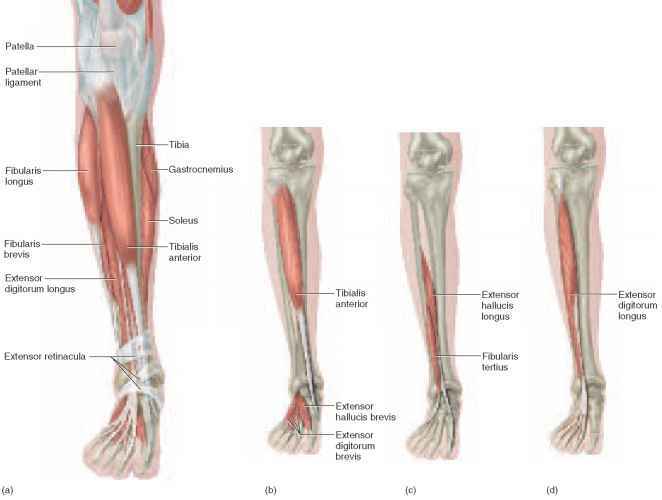 Figure 10.36 Muscles of the Leg. Anterior view. (a) A view showing some muscles of the anterior, lateral, and posterior compartments. (b-d) Individual muscles of the anterior compartment of the leg and dorsal aspect of the foot. Several of the muscles in the first three layers originate on a broad plantar aponeurosis, which lies between the plantar skin and muscles. It diverges like a fan from the calcaneus to the bases of all five toes. Not everyone has the same muscles. From the information provided in this chapter, identify two muscles that are lacking in some people. 23. In the middle of a stride, you have one foot on the ground and you are about to swing the other leg forward. What muscles produce the movements of that leg? 24. Name the muscles that cross both the hip and knee joints and produce actions at both. 25. List the major actions of the muscles of the anterior, medial, and posterior compartments of the thigh. 26. Describe the role of plantar flexion and dorsiflexion in walking. What muscles produce these actions? 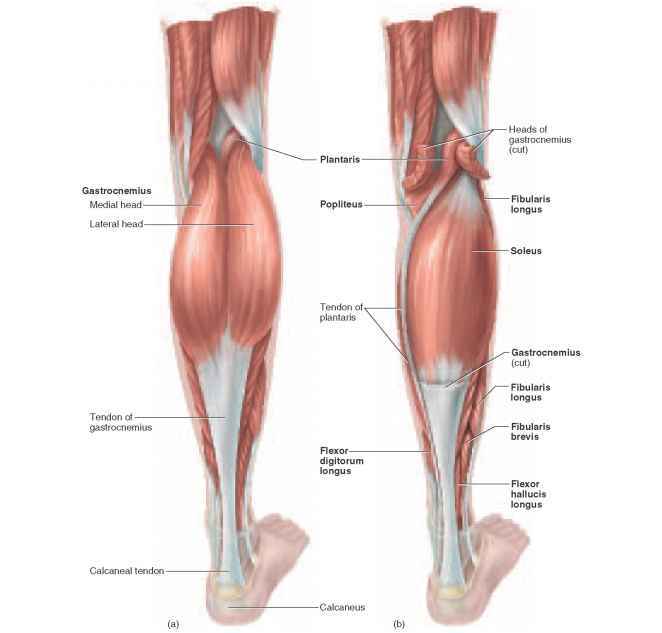 Figure 10.37 Superficial Muscles of the Leg, Posterior Compartment. (a) The gastrocnemius. 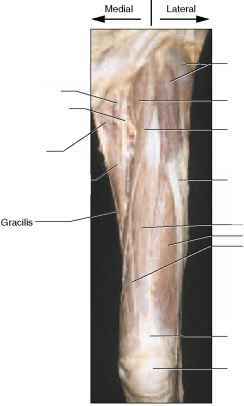 (b) The soleus, deep to the gastrocnemius and sharing the calcaneal tendon with it. 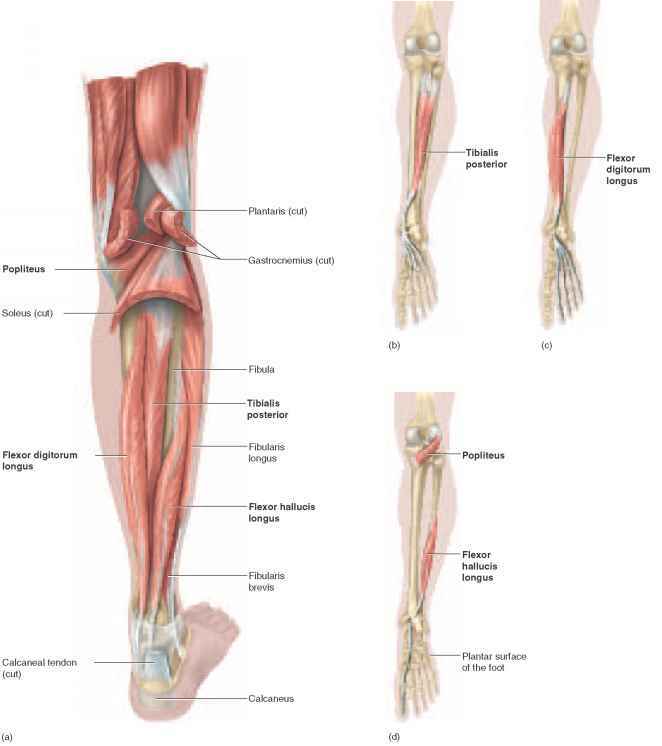 Figure 10.38 Deep Muscles of the Leg, Posterior and Lateral Compartments. (a) Muscles deep to the soleus. (b-d) Exposure of some individual deep muscles with foot plantar flexed. 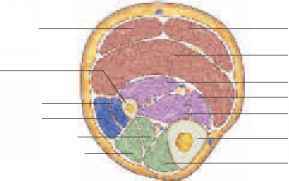 Figure 10.39 Serial Cross Sections Through the Lower Limb. Each section is taken at the correspondingly lettered level at the bottom of the figure and is pictured with the posterior muscle compartment facing the top of the page. Which of these muscles are named for the adjacent bones? N: lateral and medial plantar nn. Figure 10.40 Intrinsic Muscles of the Foot. (a-d) First through fourth layers, respectively, in ventral (plantar) views; (e) fourth layer, dorsal view. Baseball finger—tears in the extensor tendons of the fingers resulting from the impact of a baseball with the extended fingertip. Blocker's arm—ectopic ossification in the lateral margin of the forearm as a result of repeated impact with opposing players. 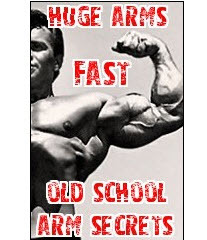 Charley horse—any painful tear, stiffness, and blood clotting in a muscle. A charley horse of the quadriceps femoris is often caused by football tackles. Compartment syndrome—a condition in which overuse, contusion, or muscle strain damages blood vessels in a compartment of the arm or leg. Since the fasciae enclosing a compartment are tight and cannot stretch, blood or tissue fluid accumulating in the compartment can put pressure on the muscles, nerves, and blood vessels. The lack of blood flow in the compartment can cause destruction of nerves if untreated within 2 to 4 hours and death of muscle tissue if it goes untreated for 6 hours or more. Nerves can regenerate if blood flow is restored, but muscle damage is irreversible. Depending on its severity, compartment syndrome may be treated with immobilization and rest or an incision to drain fluid from the compartment or otherwise relieve the pressure. Pitcher's arm—inflammation at the origin of the flexor carpi resulting from hard wrist flexion in releasing a baseball. Pulled groin—strain in the adductor muscles of the thigh. It is common in gymnasts and dancers who perform splits and high kicks. Pulled hamstrings—strained hamstring muscles or a partial tear in the tendinous origin, often with a hematoma (blood clot) in the fascia lata. This condition is frequently caused by repetitive kicking (as in football and soccer) or long, hard running. Rider's bones—abnormal ossification in the tendons of the adductor muscles of the medial thigh. It results from prolonged abduction of the thighs when riding horses. Rotator cuff injury—a tear in the tendon of any of the SITS (rotator cuff) muscles, most often the tendon of the supraspinatus. Such injuries are caused by strenuous circumduction of the arm, shoulder dislocation, or repetitive use of the arm in a position above horizontal. They are common among baseball pitchers and third basemen, bowlers, swimmers, weight lifters, and in racquet sports. Recurrent inflammation of a SITS tendon can cause a tendon to degenerate and then to rupture in response to moderate stress. Injury causes pain and makes the shoulder joint unstable and subject to dislocation. Shinsplints—a general term embracing several kinds of injury with pain in the crural region: tendinitis of the tibialis posterior muscle, inflammation of the tibial periosteum, and anterior compartment syndrome. Shinsplints may result from unaccustomed jogging, walking on snowshoes, or any vigorous activity of the legs after a period of relative inactivity. Tennis elbow—inflammation at the origin of the extensor carpi muscles on the lateral epicondyle of the humerus. It occurs when these muscles are repeatedly tensed during backhand strokes and then strained by sudden impact with the tennis ball. Any activity that requires rotary movements of the forearm and a firm grip of the hand (for example, using a screwdriver) can cause the symptoms of tennis elbow. Tennis leg—a partial tear in the lateral origin of the gastrocnemius muscle. It results from repeated strains put on the muscle while supporting the body weight on the toes. Most athletic injuries can be prevented by proper conditioning. A person who suddenly takes up vigorous exercise may not have sufficient muscle and bone mass to withstand the stresses such exercise entails. These must be developed gradually. Stretching exercises keep ligaments and joint capsules supple and therefore reduce injuries. Warm-up exercises promote more efficient and less injurious musculoskeletal function in several ways, discussed in chapter 11. Most of all, moderation is important, as most injuries simply result from overuse of the muscles. "No pain, no gain" is a dangerous misconception. Muscular injuries can be treated initially with "RICE": rest, ice, compression, and elevation. Rest prevents further injury and allows repair processes to occur; ice reduces swelling; compression with an elastic bandage helps to prevent fluid accumulation and swelling; and elevation of an injured limb promotes drainage of blood from the affected area and limits further swelling. If these measures are not enough, anti-inflammatory drugs may be employed, including corticosteroids as well as aspirin and other nonsteroidal agents. Can Golgi Tendon Organ Inhibition Impact Jump Height? Where is the soleus and fibularis longus?